Situated on the northern side of Whitchurch Road within easy reach of the western junction of the Gabalfa Interchange and hence has easy access to the City Centre and the M4 junction at Coryton, Whitchurch. 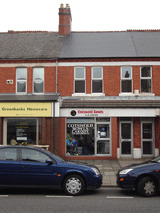 Whitchurch Road is a busy access road to and from the City Centre and incorporating a secondary shopping centre, which is also a busy bus route. The First Floor self-contained offices form part of a two-storey mid terrace property set under a pitched roof which has been reslated. It is set back from the public footpath, having a shares forecourt with the lock-up shop and premises on the Ground Floor. 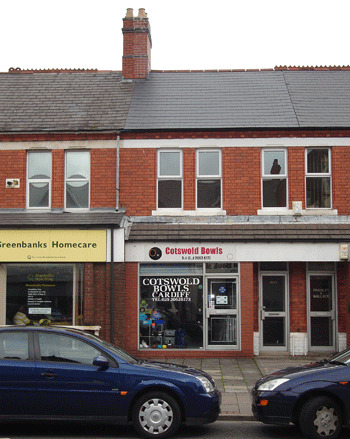 The offices benefit from UPVC double glazed windows and have recently been redecorated. Electric night storage heaters. 2.00m x 2.78m (6’7” x 9’1”) giving a floor area of 5.56 square metres (or 60 square feet). 2.82m x 3.60m (9’3” x 11’10”) giving a floor area of 10.15 square metres (or 109 square feet). 4.48m x 3.42m (15.0” x 11’3”), giving floor area of 15.66 square metres (or 169 square feet). With low level W.C., wash hand basin and Triton water heater. Thermoplastic tiled floor. Communal gravelled car parking area, shared to No.62 Whitchurch Road, and we are advised that one car parking space will be reserved for the Lessee of these offices. Available under a formal lease for a term of 3 or 6 years (subject to a rent review after 3 years). The Lessee being responsible for internal repairs and decorations, repair of the window glass, and to contribute towards the building insurance premium and exterior maintenance costs. The Lessee to be responsible for the Lessors’ Solicitors’ costs in the preparation and completion of the lease.